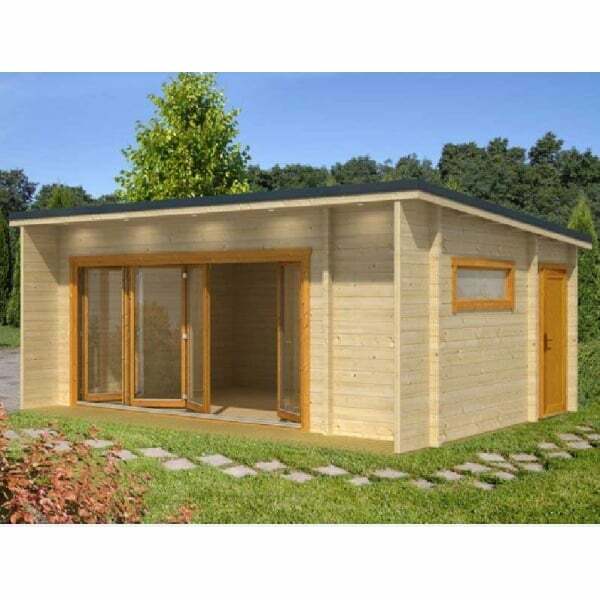 Norland Benningly Log Cabin: The Norland Benningly Log Cabin is a large 3 roomed log cabin featuring 70mm wall logs with a sheltered outside area under the 60cm canopy. Featuring its large 5 way folding door is over 4.0m wide and creates a light and airy feel in the larger of the three rooms (473.6cm x 381cm) of the building. This room then has a smaller room of 121.2cm x 241.2cm that is accessed from the main room and finally the smallest room of 121.2cm x 135.6cm is accessed from its own solid wood external door in the gable end. The Norland Benningly Log Cabin is ideal for many uses including as a garden office, temporary guest accommodation or a general extension to the living area and it also creates a perfect garden / summer room where you can set our your garden furniture, maybe create a kitchen area in the smaller room with perhaps an outside toilet in the smallest room – the possibilities are endless! Note: Image shows the doors and windows of this cabin as being treated. In fact – the door and window are delivered untreated. Building is made to order hence the extended lead-time.